Shading from the sun, shelter from the rain and a great place to enjoy a cuppa or coldie on a warm summer day. A Melbourne verandah can be a great asset any time of the year but perhaps mostly in the summer. 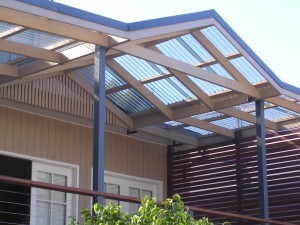 Our summers can be pretty hot so the shade a verandah can provide is invaluable. They’re also quite handy for our occasional summer thunderstorm. The other aspect of a verandah that has endeared them to Australians is that they suit any style of home. While synonymous with older style homes, verandahs also look fantastic adjoining modern homes. They can be built using a variety of materials – including timber, steel, aluminium and polycarbonate roofing – depending on your needs, the style of your house and your budget. If you’re interested in installing a verandah at your Melbourne home, contact the experts at Outside Concepts. Phone 1800 601 674 or go our website (Melbourne verandah) for information.